The staircase plays a vital role in feng shui since it moves chi energy to different levels of the home. Inauspicious staircases disrupt the balance and harmony of chi energy and affect areas of your life. 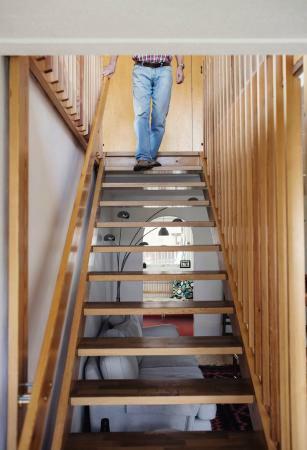 There are many feng shui tips for stairs. The basic ones can help you avoid inauspicious chi and promote auspicious chi energy traveling from the front door up the stairs to the next floor level. If carpeting stairs, avoid red carpeting since it attracts misfortune. The color red is associated with the fire element. This brings an unsettling, fiery energy rushing up the stairs and scorching everything in its path. This can bring a loss of wealth, health and even relationships. Make sure the staircase is well lit to guide the chi energy to the upper level. Adding uplighting along the landing is an excellent way to attract auspicious chi to continue to the next floor. A crystal chandelier can be used in the foyer as the preferred overhead lighting. The crystals and light will disperse chi energy up the stairs and throughout the rest of the house. Feng shui rules and guidelines are practical, so the feng shui rule for railings, spindles and newel posts is also one of safety. If your staircase has shaky or missing balusters/spindles, repair them immediately. Enhance auspicious feng shui on the stair walls with art and photos that repeat the colors assigned to that sector. Feng shui guru Lillian Too advises adding a picture or two of a feng shui good luck symbol on the staircase landing. You can incorporate vertical lines through the use of art, art objects, architectural features and other designs to attract the chi energy farther up the stairs. You can use paintings of trees, tall buildings or other subject matters with vertical lines. You can use oversized tall pottery that creates vertical lines to assist the chi energy in its rise up the staircase. Place a set of three varying sizes of ceramic vases in a staircase wall niche or along a landing. Use tall plumes of feathers or tall floral arrangements/plants to add more height. Many staircase designs and placements are inauspicious and should be avoided. There are remedies for existing staircases that can be applied. The most common feng shui problem is a staircase that is directly opposite the front door. Chi energy enters the home and rushes up the staircase, bypassing the rest of the house. Auspicious chi doesn't flow through the lower floor sectors, creating an imbalance. Remedy with a crystal chandelier or multi-faceted crystal suspended between the door and staircase to slow and disperse the chi. A staircase in the center of the home will siphon all the chi out of the home. It's better to leave the center area open or place the dining room there. However, if you have an existing home with this staircase problem, you can lessen some of the negative effects. The center of the home is ruled by the earth element. Since chi energy is being depleted with this staircase placement, add earth elements, such as crystals, pottery, paintings, and ceramics. You can also add fire elements since, in the productive cycle, fire creates earth (ash). You want to reduce the wood and metal elements. In the destructive cycle, wood destroys earth and in the exhaustive cycle, metal exhausts earth. Keep this area free of all clutter to encourage fresh chi to fill the area. The corkscrew shape of a spiral staircase creates a whirlpool effect that drains chi energy. The movement of the spiral staircase resembles that of water cascading in a waterfall. It is especially inauspicious when placed in the center of the home. You can counter the negative effects of a spiral staircase by adding an earth element at the base of the stairs. In the destructive cycle, earth destroys waters. Place a large plant in the spiral base. You can use a ceramic container to further ground the space. In the exhaustive cycle, wood exhausts water. The plant is a wood element. If your spiral staircase is made of wood, then the effects will be weakened. Metal attracts and feeds water, so avoid this element. Open risers create a sieve effect. The chi energy can never make it to the other level(s) and the family's wealth is quickly drained. The remedy for this type of stairs is to enclose the space between the risers. In feng shui, a split staircase featuring two flights of stairs, one up and one down catches chi energy in a flux of chaotic movement, unsure if it should go up or down. You can guide the chi to the main floor of your home by using color. You can paint the walls going upstairs a more prominent color. For example, if the walls are a neutral hue, choose a pale yellow on the walls going to the main floor. Use light to attract chi energy. Wall sconces and uplighting are two excellent lighting choices. You can place a potted plant at the base of the main stairs and another one at the top of the landing. It is ill-advised to have a bathroom at the top of the staircase. The chi energy rushes right into the bathroom. Remedies for bathrooms at the top of the stairs include keeping the door shut at all times and placing a plant at the top of the stairs. You can suspend a multi-faceted crystal between the bathroom and the landing to disperse the chi energy. A half or full bath under a staircase is very inauspicious. In feng shui, water under the stairs negatively impacts the second generation's success. You can somewhat remedy this by keeping the bathroom clutter free, clean and adding feng shui elements to counter the inauspicious energy generated in this room. Add elements of the sector where the staircase is located. For example, a southeast sector is governed by wood, so add wood elements and colors in your bathroom decor. A staircase leading to a lower level through a floor cutout is very inauspicious. This creates a hole in the room and the chi energy literally falls out of the room into the hole. The ideal remedy is to wall up the staircase area and add a door that can be closed. The next solution is to add a railing on along the floor line. If this isn't feasible, place plants along the cutout to define there is a hole in the floor. Tall plants are best. You could also place a tall piece of furniture, such as a bookcase or folding screen to create a faux wall and set a plant at the top of the stairs to define the stairs. There are three sectors that are best to avoid placing a staircase. East: This is your health sector. A staircase can make your health go up and down. Southeast: This is your wealth sector. A staircase creates too much up and down movement of chi energy that can introduce volatility to financial concerns. Southwest: This is your love sector. A staircase will make your love life confusing, not knowing whether it is up or down. The best staircase design is wide enough for two people to pass each other going up and down. The staircase should have a gentle curve to the top floor. This allows the chi to slowly and naturally make its way to the upper level, maintaining balance and harmony. The space between risers should be solid to support chi energy. The best location for a staircase is along an outer wall. Locate stairs in a house sector where inauspicious flying stars are located to suppress these bad luck star(s). Don't place a half bath underneath a staircase. Instead, create a cleaning supply storage closet. Since staircases occupy a sizeable amount of space, you can use them to activate a sector through the use of elements. These elements include wood, metal, and earth. 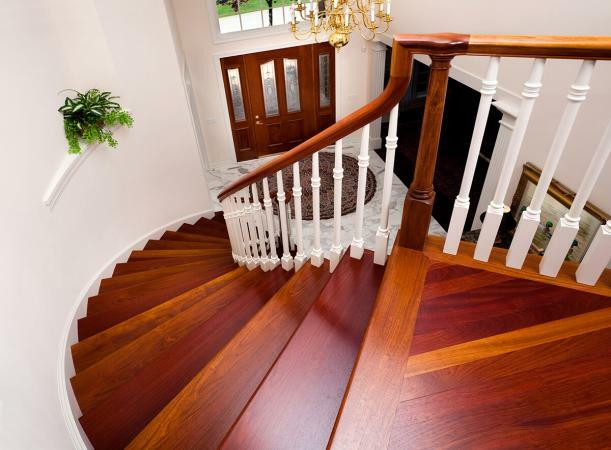 Wood staircases are ideal for the east, southeast and south sectors. Avoid metal railings on a wooden staircase. Metal cut into wood and destroys (destructive cycle) it. This element for a staircase can be placed in the west and northwest. In the productive cycle, metal attracts water, which is the element governing the north. The earth element is ideal for the northeast and southwest. In the productive cycle, the earth element creates metal. Use this element for stairs in the west and northwest sectors. Avoid using this element in the north sector since earth destroys the water element (destructive cycle). Avoid using wood railings since wood destroys earth in the destructive cycle. Auspicious staircases assist the chi energy to flow through your home. Stairs built according to feng shui principles and rules ensure your home and family will live in harmony.